MOUNTAIN VIEW, CA--(Marketwire - October 29, 2009) - VeriSign, Inc. (NASDAQ: VRSN), the trusted provider of Internet infrastructure services for the networked world, today announced that Germany's leading multichannel bank, Postbank, is bringing trust and reassurance to its iPhone-equipped mobile banking clients through VeriSign® Extended Validation (EV) Secure Sockets Layer (SSL) Certificates. Dedicated to providing customers with a safe and trusted online banking experience, Postbank has protected its Web site with VeriSign EV SSL since October of 2007. By extending that protection to its iBanking offering, Postbank is making online banking safer than ever. This month, Postbank began offering the same safeguards to iPhone users who access its iBanking service via their Safari mobile browsers. By equipping its acclaimed iBanking site with VeriSign EV SSL protection, Postbank offers an instantly recognizable visual cue that tells customers they have reached a site whose authenticity has been verified by VeriSign. When Postbank customers reach the authentic iBanking site, their Safari browser's address bar turns green, signaling they can conduct their transactions with confidence and that all data transmitted to the site will be encrypted. The green address bar is valuable for mobile banking customers because identity thieves use phishing schemes to lure banking customers to look-alike Web pages designed to steal account numbers, passwords and other sensitive information. Even the most convincing fraudulent pages, however, cannot replicate the color of the browser's address bar. For two years in a row, Postbank iBanking has topped CHIP magazine's annual ranking of Germany's mobile banking services. 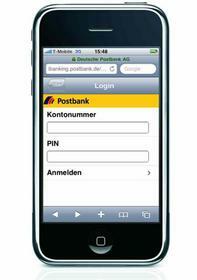 In its 2009 evaluation, CHIP said Postbank has set a new standard for mobile banking with its iPhone-optimized Web site. "Postbank has offered mobile banking services to its iPhone-equipped clients since Apple launched the iPhone in 2007," said Michael Heinen, business unit manager of Direct Banking at Postbank. "With the launch of the VeriSign EV SSL Certificates for iBanking on the iPhone, we're taking a huge step forward in our efforts to build trust and reassurance for this fast-growing segment of our customer base. Thanks to the clearly visible green address bar that EV SSL enables, the Postbank homepage clearly stands out from other Web sites. That means for more users, Postbank iBanking provides a friendlier, safer experience." "Increasingly, banking customers are accessing services via their mobile phones and devices," said Tim Callan, vice president of product marketing at VeriSign. "Postbank's decision to protect its iBanking customers with VeriSign EV SSL is a strategic move that will continue to pay dividends both for Postbank and its clients. In a marketplace where quality of service determines winners and losers, innovators like Postbank are leading the pack." As the most respected and trusted SSL authority on the Web, VeriSign is the EV SSL Certificate provider of choice for more than 12,000 online businesses. In fact, more than 95 percent of the Fortune 500 and 97 of the world's 100 largest SSL-using banks secure their sites with SSL Certificates sold by VeriSign. * To learn more about VeriSign EV SSL, visit http://www.verisign.com/EV-SSL. Statements in this announcement other than historical data and information constitute forward-looking statements within the meaning of Section 27A of the Securities Act of 1933 and Section 21E of the Securities Exchange Act of 1934. These statements involve risks and uncertainties that could cause VeriSign's actual results to differ materially from those stated or implied by such forward-looking statements. The potential risks and uncertainties include, among others, the uncertainty of future revenue and profitability; potential fluctuations in quarterly operating results due to such factors as the risk that VeriSign's announcements may not result in additional products, services, customers, profits or revenues; and increased competition and pricing pressures. More information about potential factors that could affect the company's business and financial results is included in VeriSign's filings with the Securities and Exchange Commission, including in the company's Annual Report on Form 10-K for the year ended December 31, 2008 and quarterly reports on Form 10-Q. VeriSign undertakes no obligation to update any of the forward-looking statements after the date of this press release. ©2009 VeriSign, Inc. All rights reserved. VeriSign, the VeriSign logo, VeriSign Secured, the Checkmark Circle logo, and other trademarks, service marks, and designs are registered or unregistered trademarks of VeriSign, Inc., and its subsidiaries in the United States and in foreign countries. All other trademarks are property of their respective owners.